Medium-fast setting, full-bed deformable fluid adhesive applied in a single coat for laying large ceramic floor tiles. 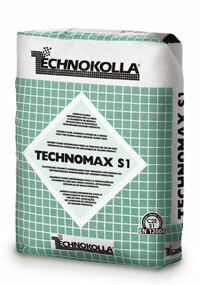 Ideal for over-tiling and use on heating screeds. Excellent as skimming coat in layers up to 15 mm thick. - Fixing ceramic floor tiles of all types, even in large sizes, indoors and outdoors. - Over-tiling on top of old ceramic tiles without use of primer. - Suitable for use when high performance is required, such as tile laying in industrial environments. - Leveling horizontal surfaces, which can be covered after 24-72 h, in layers up to 15 mm thick. Cement-based screeds, anhydrite screeds¹, concrete, aerated concrete, old ceramic floors, RASOLASTIK range and RASOGUM, old linoleum floors², PVC² or vinyl², wooden floors and panels².